Patrick Mahomes has looked more human over the past two weeks, but he was not exactly humbled in New England. He will put up more big numbers without errors against the Bengals, who will have plenty of lapses in the back seven, something Kareem Hunt also will exploit in the running game. The Chiefs’ defense will overachieve as Andy Dalton faces too much prime-time hostility on the road. The Chargers don’t even get to play real home games in Los Angeles, so playing a game in London won’t faze them. It’s time to raise a pint to Melvin Gordon and Philip Rivers, the gin and tonic of their offense. The Titans, meanwhile, will be doing a lot more punting on the Thames. LA will rock the UK and remind everyone it’s an AFC title contender, and Tennessee will begin its fade. The Buccaneers got a defensive wake-up call with the firing of coordinator Mike Smith, and they will be motivated to go after Baker Mayfield with more jobs on the line. Jameis Winston in his return last week picked up where he left off last season, and he will push the ball downfield against the Browns. Mayfield will duel the fellow Heisman winner, but the effort on the road won’t be good enough. The Jaguars play better at home, but without Leonard Fournette, they have become more dependent on Blake Bortles, and the pressure is getting to him. Likewise, though, Jacksonville will get after Deshaun Watson, who has been under siege this season behind the NFL’s worst offensive line. There will be sacks and sloppiness galore in this game, but ultimately, the hosts will regain first place in the AFC South. Tom Brady and the Patriots survived a shootout against the Chiefs last week, and they draw a similar, versatile Bears offense in Chicago. The Bears’ defense will play better away from the Miami heat with Khalil Mack doing his best to keep the visitors in the cold. The difference will come late, when New England will be more committed to power running to ice the game after Brady puts them ahead in the fourth quarter. Dak Prescott and Ezekiel Elliott have found their groove together, as the offense is finally playing to the QB’s strengths. 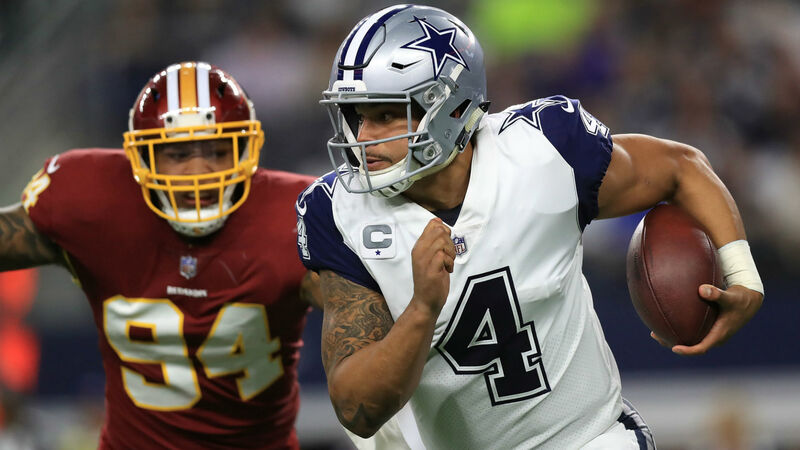 The Cowboys’ defense is starting to become nasty on every level and will get after the Redskins’ limited passing attack after slowing the run. Washington has played well at home, but Dallas is the better overall team. Prescott has never lost to his team’s archrival, and he isn’t about to start now. San Francisco turned in a solid defensive performance in Green Bay, but things will be different against a Rams team led by better offensive coaching. Todd Gurley will be slowed down a little as the 49ers’ focus, but San Francisco’s secondary can’t match up with LA’s versatile receivers. The Giants will stay in the game with plenty of Saquon Barkley, this time with more help from Odell Beckham Jr. and Sterling Shepard. But Matt Ryan and the Falcons are extremely hard to beat in Atlanta. Of the reeling defenses, the home team’s depleted unit will give the more inspired effort to make a few key stops. Get this: A rare Julio Jones TD late in the game will ruin the chance of a Giant upset.